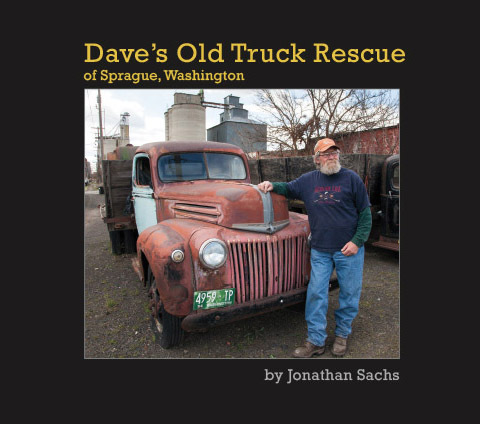 This site is all about Dave Jones' collection of old trucks in Sprague, Washington. And the photos and books that Jon Sachs made when he stumbled on Dave's collection. Dave's truck collection sits on a lot in Sprague, no signs, no fence. You are welcome to wander among the trucks, take all the photos you like, or sit and paint pictures. We're starting to call this Dave's Truck Rescue project, since what he is doing is rescuing these fine old trucks from the crusher. Learn more about truck collector Dave Jones in his own words. Trucks at Dave's lot in Sprague, Washington. See the trucks. See a gallery of photos of colorful details of Dave's trucks. Learn more about Jon Sachs, the photographer who created this site. The book is now for sale at reduced price: only $9.50! Check out the store page! Website created and maintained by old truck fan Jon Sachs. All stuff © 2012 Jonathan Sachs Graphics.